The Certificate of Higher Education Business (OERu) and the Certificate in First Year Foundations are exit qualifications at the first year, undergraduate degree-level. Theses certificates provide pathways to transfer into a Bachelor’s degree. Certificate of Higher Education Business (OERu): Learners are required to successfully complete the assessments for each of the four associated micro-certifications to qualify for transfer credit for the Learning in a digital age course. Certificate in First Year Foundations: Learners must first complete three micro-courses, and take the TECEP® exam (single assessment) to qualify for academic credit for the Living in the Information Age course. 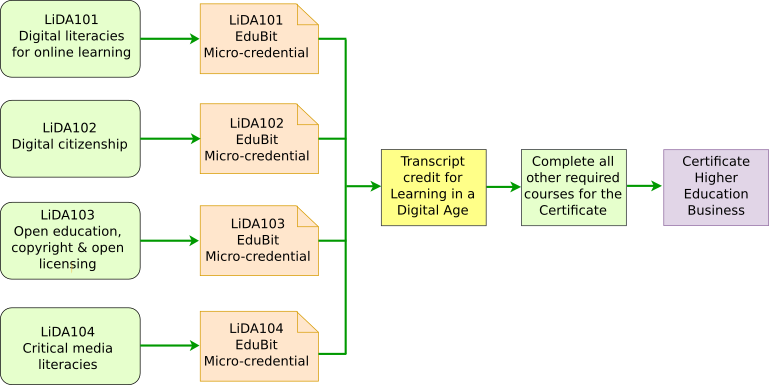 Complete the Edubit assessments for each of the four associated micro-certifications to qualify for transfer credit for the Learning in a digital age course. Request transcript credit for Learning in a digital age from Otago Polytechnic. Complete all the required courses and get copy of transcript credit from assessing institution(s) before applying for the qualification at the University of the Highlands and Islands. Sign up for an account on the EduBits and locate the EduBit for Critical media literacies and associated digital skills. Upload your assessment file on the EduBits site. Click on the “Get my Assessment Marked” link and pay the assessment fee by credit card. If successful, you will receive your assessment result by email and you can follow instructions to collect and publish you micro-certification online. Successfully complete the four EduBits for Learning in a digital age. Pay the transcript administration fee. Complete all the required courses for the Certificate Higher Education Business (OERu). Gather transcripts for transfer credit from the OERu assessing partners (you only need to apply for one transcript for all the courses you completed at the respective OERu assessing institution). Apply for the qualification at the University of the Highlands and Islands to become a credential candidate. Once all the requirements have been met, including a review of the transcripts from the approved OERu assessing partners, you will graduate with the Certificate Higher Education Business (OERu). Complete the following three micro-courses to qualify for academic credit for the Living in the Information Age course. Take the TECEP® exam (single assessment) at Thomas Edison State University to qualify for academic credit for the Living in the Information Age course. Complete all the required courses and apply for the qualification at the Thomas Edison State University.